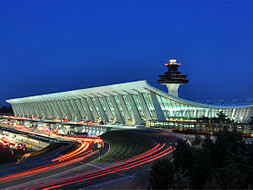 Washington Dulles International Airport located just 26 miles from downtown Washington, DC in Chantilly, Virginia. Opening in 1962, Dulles was built to meet the growing demand for airport capacity in the Washington area even though the new Washington National Airport had only been open for a short time. After studying a number of possible locations, then President Dwight Eisenhower chose a 10,000 acre site surrounded by open farmland and far enough away from other airports to provide adequate airspace for arriving and departing flights. The immense size of the new site allowed for Dulles to be the first airport in the country designed for commercial jets, to be buffered from its neighbors. With only 3,000 acres of the 10,000 acres graded for the new airport allowing boundaries to be established of at least 8,000 feet from the end of all runways. This planning, in conjunction with the actions of local governments to properly zone the land around the site, helped the new airport to be a good neighbor in the Virginia countryside. Dulles Airport is now a major hub for domestic and international air travel with a mixture of legacy and low fare carriers that provide air service throughout the world. And has significant capacity for future growth. Its current four-runway configuration has a capacity of up to 600,000 aircraft operations per year. With a future fifth runway constructed, the airfield capacity could increase to 1 million aircraft operations per year. Unlike Reagan National Airport, Dulles International does not have the 1000 mile distance restrictions placed on it for its non-stop flights. Also as an international airport, you’ll find representatives of the U.S. Customs Service, U.S. Immigration and Naturalization Service, and U.S. Department of Agriculture working together to process arriving international passengers and dignitaries. As an international airport, Dulles is the chosen airport for many foreign officials, dignitaries and business executives. And their choice for getting to and from the airport is by limousine. As one of the top choices for airport limousine service, you’ll often find Global Express at Dulles airport. Our clients know that by choosing Global Express Limousine, they always receive the most personalized, convenient and responsive “black car” experience.